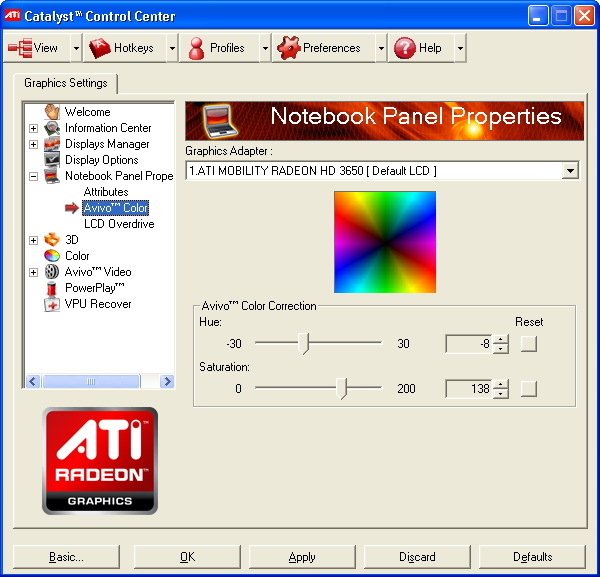 Open the Catalyst Control Center, in the top left hand corner click on Graphics and go to desktop properties and click the color tab. Set Gamma to 0.85 (all channels) and hit apply, then click graphics again on the top left and go to desktops and displays. Right click on the little laptop icon at the bottom left and select configure, then go to the color tab (or Avivo tab depending on what driver you are using) and set Hue to -5 and Saturation to 85 and hit apply. You now have a nicely configured and natural looking RGB LED screen!